Cabo Pulmo's living coral reef is by far the best snorkeling spot in all of Baja! The reef has recently been declared the world's most robust marine reserve in a National Geographic article. The Old Port in Todos Santos provides a protected zone great for snorkeling in the Pacific. The best way to get to the Old Port: Kayak! thats right, no crowded parking lots and no crowds! You'll kayak along Pacific cliffs where sea lions snooze on the rocks and play tag in the water. There are lots of unusual blow-holes, caverns and caves in the rocky outcropping. After about a 30 minute paddle, you'll arrive in the port and set anchor to snorkel. 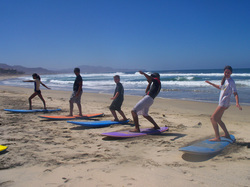 Salvavidas Junior / Junior Lifeguards returns to Todos Santos this July 2012! This fun aquatic program is designed for students between 9 and 18 years of age. Participants will be trained by certified teachers, lifeguards and master divers and receive instruction in the following: Basic water safety, flotation, rip currents, emergency response, snorkeling, kayaking, boogie boarding stand-up paddle boarding, and surfing.